____ WhereIsHolden? : Day 34: Free Mount is conquered! I might be writing out of turn here, but I believe that I can free mount with less than 3 tries at any given time, and so I'm counting that as a win for the time being! I took a long ride this afternoon after work and went up and down main street, all around the park -- probably totaling about 1.5 miles total! 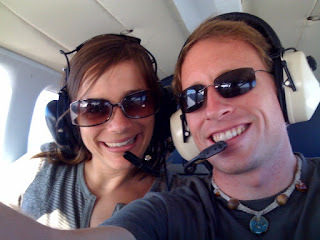 Random picture of MAS and I flying in a Piper Cherokee, over to Catalina for a hike and snack, courtesy of MA_Air, who sometimes orders Buffalo Burgers over the aviation airwaves, thanks to the helpful tower folks at "Airport in the Sky!" Because of a business / pleasure trip, I'll be away from the 'cycle for the next 5 days. Curious how things will fall apart in that time, I'm still excited to ride and get better when I return (and I'll try and get some multi-media going for the next update! 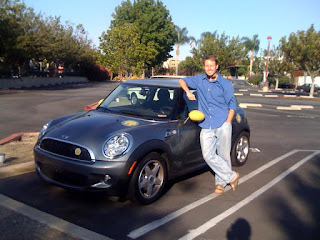 A friend's MINI E (fully electric Mini Cooper) car that I'm super excited about. The future is here, folks, and it's totally awesome. 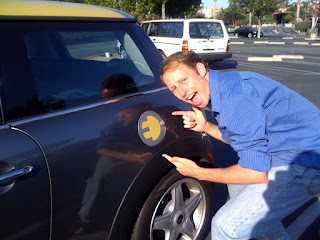 Get some electrons -- from anywhere, solar, wind, or plain old coal, and you'll be doing your grand-children a favor!